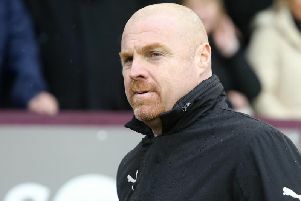 Dyche sympathises with Lampard over ‘spygate’ - but would prefer diving was stamped out first! Sean Dyche admits he has some sympathy with Derby County boss Frank Lampard over the ‘spygate’ scandal. But he would prefer the authorities try and clean up the game on the pitch, rather than concern themselves with who is gleaning information from training grounds. Leeds boss Marcelo Bielsa came clean before their meeting with Derby last Friday, admitting he had instructed a member of staff to spy on a Rams training session, with the EFL launching a formal investigation. The Argentine took matters into his own hands in an extraordinary press conference on Wednesday, revealing he had done similar with every opponent he has faced in the Championship this season. Dyche feels Bielsa overstepped the mark, but would prefer more of a fuss to be made about kicking diving out of football: “I think certainly, just as a manager, I understand Frank Lampard feeling not overwhelmed with joy about the situation. “I understand Bielsa saying it’s not illegal, as in you’re not going to get locked up by the police, but there’s a gentlemanly conduct in the game and a way of operating. “On the other hand, I was amusing myself with the furore about it. “Some people use the dreaded word cheating. If you think about it, no one wants to sort it out on the pitch, so I don’t really know why people are bothered about off the pitch. “So, that side of it, I don’t really know what the noise is about. Asked what there is to gain from spying on another team’s training sessions, Dyche added: “Everyone’s looking for the one per cent. Sir Dave Brailsford coined the phrase ‘the marginal gains’, in analysis, science, tactics, technical drills, everything. “You can pick up little bits, but that can be important. That one clue at a set piece, that there might be a change, that can mean something. “The presentation on the analysis was interesting, a lot of people in the game are doing that sort of thing. Burnley still have a top pitch visible clearly from the path to Gawthorpe Hall, which is still used fairly regularly, so is security an issue? “Not for that reason. Just common sense security. We’re pretty open but we’ve got a gatehouse. We’re not going to start worrying about it that much. If people want to go to all that work to see a set piece, it wouldn’t please me but it seems some people are saying it’s expected and normal, so that’s the way it goes. “I’ve seen people wondering around, but who knows. To be thinking that sort of thing has never happened - it’s the detail in it, someone is literally an employee. “That’s unusual. Binoculars, unusual, not just someone walking their dog. “It’s a little more detail. I imagine that’s what Frank Lampard was alluding to. There’s a professional courtesy and behaviour where that would be frowned upon. “But I was giggling about the noise. Every week people doing all sorts that shouldn’t be done and allowed. Hardly a squeak. “That times 100 every weekend. What’s that about. If that’s the worst, no way. Has Dyche ever deployed anyone to spy on an opponent? “Not for me. There are certain ways I believe are correct for myself, not judging others. “The reality is if someone texts you a team and I’ve heard the team’s this. You’d still go, I’m not sure? “Players tell their agents, their mate, come on, they’re human.